Once you find out that you are pregnant, nutrition should be your top priority. Normally everybody wants the best for their baby, so getting all the necessary nutrients for a normal development of your little one is very important. A diet adjustment is often needed as the pregnancy progresses in order to meet the needs of the growing baby. Certain foods should be avoided during the 9 months of pregnancy, while other foods that you probably not like that much should be part of your diet due to their nutritious values. How about sweet potatoes? Can you eat sweet potatoes while pregnant? Can You Eat Sweet Potatoes During Pregnancy? Sweet potatoes are safe to eat during pregnancy. They are very healthy as well. However, don’t forget to wash the sweet potatoes carefully before consuming them now that you are pregnant. When unwashed or not washed carefully, sweet potatoes may contain bacteria and parasites which can lead to foodborne illnesses like listeriosis or toxoplasmosis. Sweet potatoes are packed with vitamin A. According to the American Pregnancy Association, a pregnant woman needs about 700 micrograms of vitamin A per day. One cup of cooked sweet potatoes contains about 1922 micrograms of vitamin A. Sweet potatoes are packed with vitamin C and iron. Iron is an essential mineral for you and your baby, while vitamin C helps its absorption in the gastrointestinal system. According to the National Institute of Health, a pregnant woman needs about 80 to 85 milligrams of vitamin C a day and about 27 milligrams of iron a day. Only one cup of cooked sweet potatoes contains about 39.2 milligrams of vitamin C and about 1.38 milligrams of iron. Sweet potatoes are a great source of fibers. Constipation is a common problem during pregnancy, so getting enough fibers is very important. During pregnancy, women should eat about 28 to 34 grams of fiber a day. Only one cup of cooked sweet potatoes contains about 6.6 grams of dietary fibers. Sweet potatoes are packed with potassium. Pregnant women should take about 4.7 grams of potassium a day, while when breastfeeding they should take about 5.1 grams of potassium a day. Sweet potatoes contain about 950 milligrams of potassium. Sweet potatoes are packed with vitamin B6. Vitamin B6 is very important during pregnancy as it promotes the production of red blood cells. According to the American Pregnancy Association, a pregnant woman should consume about 1.9 milligrams of vitamin B6 a day. Only one cup of sweet potatoes contains about 0.6 milligrams of vitamin B6. Vitamin B6 can also prevent morning sickness. Sweet potatoes are known for their antioxidant properties and help your body prevent various inflammatory problems such as arthritis, asthma, gout, etc. Sweet potatoes are recommended for diabetics as they are a great source of carbohydrates. Regular consumption of sweet potatoes during pregnancy can help regulate the levels of blood sugar as well as prevent insulin resistance. Sweet potatoes boost the immune system as they are packed with various nutrients, vitamins, and minerals. Sweet potatoes help prevent cardiovascular diseases such as heart attack or stroke. This health benefit of sweet potatoes is related to their potassium content. Potassium also plays an important role in the fluid balance and electrolyte balance in the human body, very important for a normal blood pressure and heart function. Sweet potatoes do wonders when it comes to muscle cramps. Everyone who has been pregnant before know that muscle cramps and especially the restless leg syndrome are a common problem during pregnancy. By eating sweet potatoes, fewer muscle cramps and an energy boost will be provided. 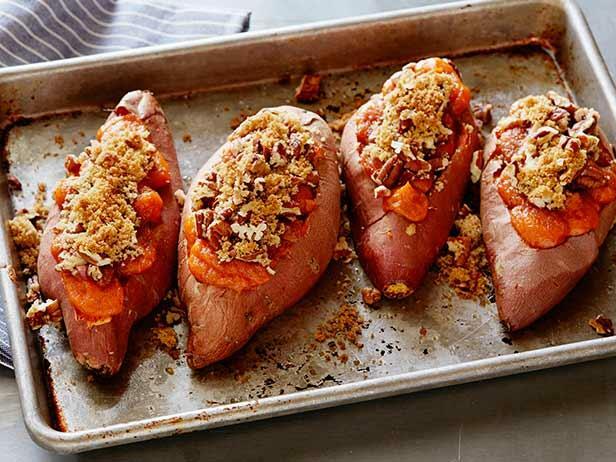 Even though we all like baked potatoes and French fries, you will get the most from sweet potatoes by steaming or baking them. Seasoning sweet potatoes with herbs only is healthier than when eating them seasoned with butter, oil, or cheese. Sweet potatoes are packed with vitamin A as mentioned above. Increased consumption of vitamin A has been linked to birth defects and malformations. The World Health Organization recommends that a pregnant woman will not have any benefit when taking 3 times more of vitamin A than the recommended RDA. Consuming more than 10,000 UI of vitamin A can lead to miscarriage, stillbirth, congenital liver failure and other birth defects. As long as you consume sweet potatoes in small amounts during pregnancy, there is no reason why you should totally avoid this root veggie from your diet. Besides sweet potatoes during pregnancy, you may want to include the following healthy foods into your diet. Plain yogurt should be part of your diet during the entire nine months of pregnancy as it is packed with calcium and zinc. Today you can find plain yogurt which is fortified with vitamin D as well. By making plain yogurt part of your daily diet during pregnancy, you will not get only calcium and zinc, but also the necessary carbohydrates, proteins, vitamin B, etc. Brown rice, whole-wheat pasta, whole-wheat flour, and oatmeal, are types of whole grains which are very healthy and should be consumed during pregnancy. These whole grains are packed with fiber, carbohydrates, zinc, iron, folic acid, vitamin B, vitamin D, calcium, etc. Round tip, top round, top loin, the eye of round, bottom round or tenderloin are the best kinds of lean beef you can get. Beef is packed with choline, but you will also get zinc, iron, proteins, vitamin B6, and vitamin B12. Cheese is not only packed with calcium, proteins, carbohydrates, fat, and vitamin B12, but it also helps prevent gingivitis and other dental problems. If you eat cheese after having a meal, the acids on your mouth will get neutralized and cavity formations together with other dental problems will be avoided. Peanuts, soybeans, black beans, chickpeas, lentils, etc., belong to the legume family. Legumes are a great source of various nutrients, especially for vegetarians. They are packed with carbohydrates, fiber, iron, zinc, calcium, folate, proteins, etc. Seafood is always a good option due to the fact that they are packed with omega-3. Try eating as much seafood as you can during pregnancy, especially salmon, haddock, cod, etc. You have probably heard that eggs are a great source of proteins. But, eggs are not only a great source of proteins but they are packed with choline and other minerals as well. Choline is very important when it comes to the development of your baby’s nervous system. It can even help prevent neural tube defects. Fruits and vegetables are very healthy packed with vitamins and minerals. They should be part of your daily diet, especially now that you are pregnant. Try eating different kinds of fruits and vegetables for a better health of yourself and your baby. Is It Dangerous to Have No Heartbeat at 12 Weeks? Can Birth Control Cause Diarrhea?